STEP 1: Take bus to "Chuncheon" at Incheon Airport, Terminal 1, 1st Floor, Bus Stop 9C. (NOTE: Now also available at the new Terminal 2 of Incheon Airport).This bus will also stop at Gimpo Airport and Cheongpyeong Cross-Country Bus Terminal before arriving at Gapyeong. Get off the bus at Gapyeong Intercity Bus Terminal, which is one station before Chuncheon. Bus Ticket Fare: KRW21,300. Trip Time: 2 hours+ (approximately). STEP 2: In front of Gapyeong Intercity Bus Terminal, take Shuttle Bus for Gapyeong Tourist Resort (Course A) to go to Nami Island. This bus can also bring you to Gapyeong Train Station, Gapyeong Rail Park (Rail Bike), Petite France and The Garden of Morning Calm. Bus Ticket Fare: KRW6,000 (day ticket, unlimited use). Trip Time: 25 minutes. 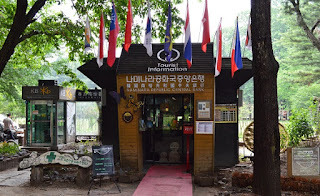 TIP 1: Keep the ticket for Shuttle Bus for Gapyeong Tourist Resort (Course A) after you have arrived at Nami Island. You can use the same ticket to visit Petite France or Garden of Morning Calm after visiting Nami Island. You can also use the same ticket to take Gapyeong City Tour Shuttle Bus to return to Gapyeong Intercity Bus Terminal to take bus to your next destination or Gapyeong Station to take train to Seoul. Click here if you are looking for on how to go from Seoul to Nami Island. TIP 2: If you are travelling with baggages from Incheon Airport, you can store your baggages in coin operated lockers after arriving at Nami Island. These lockers are located near the near ticket counter and male washroom (WC). You can rent one after buying your tickets for Nami Island, before heading to the ferry whalf to take the ferry to cross the river to Nami Island. 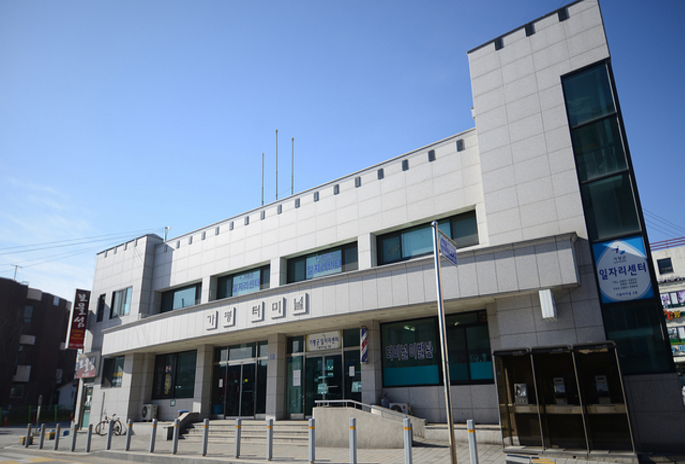 Upon arrival at Incheon International Airport, proceed to Bus Stop 9C located at 1st Floor of the terminal building to take the bus to "Chuncheon". The bus ticket price is KRW21,300 for adult. Incheon International Airport -> Gimpo International Airport -> Cheongpyeong Cross-Country Bus Terminal -> Gapyeong Cross-Country Bus Terminal (Get off here for Nami Island) -> Chooncheon Cross-Country Bus Terminal. As you can see, there is one bus departing from Incheon Airport every 1 hour to 1 hour 20 minutes. It is a long journey (about 2 hours on the bus). You can take a nap but be sure to get off the bus at Gapyeong Intercity Bus Terminal, which is the second last bus stop. 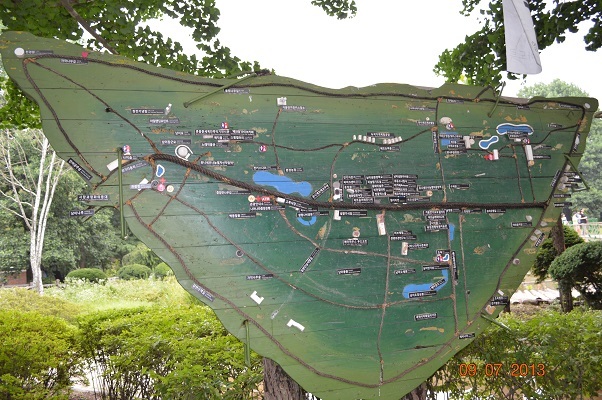 From here, Nami Island is only 25 minutes away (See Step 2 below). Once you have arrived at Gapyeong Intercity Bus Terminal, take Shuttle Bus for Gapyeong Tourist Resort (Course A) to go to Nami Island. It is just a short 25 minutes bus trip. This is how the bus looks like. You can buy the bus ticket from the driver. The bus ticket costs KRW6,000 but it is really worth the money because you can hop on and hop off the Shuttle Bus for Gapyeong Tourist Resort (Course A) for unlimited number of time on the same day. As you can see, Nami Island is the 4th bus stop after departing from Gapyeong Intercity Bus Terminal. After visiting Nami Island, you can hop on to the same bus to any destination on the route. The most popular destinations in Gapyeong after Nami Island is Petite France and The Garden of Morning Calm. Recently, rail bike at Gapyeong Rail Park is the new popular activities for tourists especially among young lovers who wants the sweet memories of biking on the rail while enjoy the beautiful and romantic scenes along the rail. So, make sure that you keep the bus ticket for the whole day. There is also a reverse route bus that will take you back from the Garden of Morning Calm through all bus stop on the route to go back to Gapyeong Intercity Bus Station. If you want to catch a train to Seoul on your way back, you can get off the bus at Gapyeong Station to take the train. Here you are, finally you arrive at Nami Island by bus from Incheon Airport. Nami Island, being an "island" is on the other side of the river from where the bus drop you off. From here, there are two options to cross the river to get to the real Nami Island. One is to take the ferry at the ferry whalf and the other option is to take the zip wire skyline (if you like adventure). That's all. Taking bus from Incheon International Airport is simple and straight forward. Have a relaxing and joyful time at the beautiful and romantic Nami Island. Is the bus ticket KRW21,300 or KRW12300. Step 1 says KRW21,300 but the Details of Step 1 says KRW12,300. Which is correct? Thank you for pointing out the error. The correct bus ticket price for bus from Incheon Airport to Gapyeong is KRW21,300. It has been corrected above. Hi, can you advise how to buy the bus tickets from Incheon airport to Gapyeong? Is advance booking needed and available? You can buy the bus ticket to Gapyeong at the bus ticket booth when you arrive at the arrival hall of Incheon International Airport (1st floor). The last time I checked it was 1000Won for a small locker and 1500Won for a big sized locker. The price might have increased a little but shouldn't be too much. Thank you, the price is for whole day already? Not per hour? Hi...do they accept debit card in purchasing the ticket to gapyeong? How about from Gapyeong to Incheon Airport? Hi.. On October 16, 2018, I went to Korea, and planned to go to Gapyeong directly from Incheon. But apparently the information you gave were wrong, the bus to Cuncheon was not in 9C, but at 13A, and the fare to Gapyeong is KRW 18.400. Please correct it. May I know the bus transport from Nami island to Gimpo airport? We plan to travel from ICN airport to Nami island on 22/10 taking shuttle bus krw21,300 to gapyeong bus termibal. Can this bus ticket be used for transfer back to ICN on 23/10? Ticket krw6000 bought from gapyeong bus terminal to Nami island on 22/10, can b used unlimited access to petite France, glory mornibm calm on 23/10? ?